Wisdom to reenergize teachers of all ages and at all stages, from the "New York Times" bestselling author of "Teach Like Your Hair's on Fire"
If Rafe Esquith's "Teach Like Your Hair's on Fire" was food for a teacher's mind, "Real Talk for Real Teachers" feeds the teacher's soul. In this inspiring book, the genius behind the triumphs in Room 56 and on the stage with the Hobart Shakespeareans returns with words of wisdom and advice for those who struggle day to day in the world's hardest profession. After thirty-plus years in the job, Esquith still puts in the countless classroom hours with which any dedicated teacher will be instantly familiar. He recognizes that new teachers and veteran educators need different kinds of nourishment, whether it's encouragement to see through a teacher's difficult early years, advice on midcareer classroom building, or novel ideas for how longtime educators can put their expertise to work. Mixing his trademark offbeat humor and no-nonsense maxims with instructive stories and useful in-class advice, Esquith proves the perfect companion for teachers who need a quick pick-me-up, a long heart-to-heart, or just a momentary reminder that they re not alone. 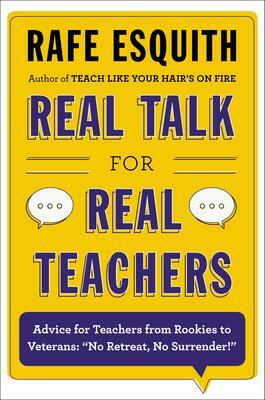 "Real Talk for Real Teachers" is from-the-hip advice to help teachers of every stripe cope with the overwhelming challenges of the classroom and beyond. Rafe Esquith has taught at Hobart Elementary School in Los Angeles for twenty-eight years. He is the only classroom teacher to have been awarded the president s National Medal of the Arts. His many other honors and awards include the American Teacher Award and "People" magazine s Heroes Among Us Award. He lives in Los Angeles."